Sometimes, people tell me they’ve always had an idea for a picture book. And, sometimes, when they tell me what their idea is — A toothbrush that joins forces with some dental floss to fight crime! An explanation of why all children are special told in the style of Geoffrey Chaucer — all I can do is look pleasant and nod because it doesn’t seem like a good idea to me, but I’m too polite to say so. Of course, there’s always the chance I could be wrong. Like if someone had said to me: “I want to write a picture book about a bucket list for a dog,” I might not immediately have thought the idea had potential. But it does. At least in the hands of author Kate Klise and illustrator M. Sarah Klise. 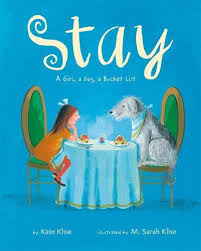 Together, they have created STAY: A GIRL, A DOG, A BUCKET LIST, which was published by Feiwel and Friends this year. And, yes, it is about a dog that’s getting older and dying. Which initially would have given me pause, because most parents don’t want their children to start worrying about when the family pet might pass away. But this story handles things beautifully. It’s essentially a tale (tail?) of friendship. Eli the dog has always been there for Astrid, from the moment she joined her family as a small baby and all along as she grows. They do all the things kids and dogs do — visit the park, sleep in the same bed. Share snacks. After that, Astrid starts creating a bucket list for Eli. The word “death” is never used — on the list or in the book. But the list contains things Astrid thinks she and Eli should do together before Eli gets too old. And, it’s a great list. Eli and Astrid go for a bike ride, read books, see a movie, and sleep under the stars and under Astrid’s covers. Astrid even gives Eli a bubble bath. Throughout their adventures, Astrid is leading the way. Eli enjoys what they do, but it’s Astrid’s list, and it’s as much for her as it is for Eli. Then, after the items on the list are checked off, Eli gets too tired to do anything but stay at home with Astrid. How does it end, you ask? Beautifully, but I’m not going to tell you how, except to say Eli does not die in the book and that the ending is the “Awwww ….” moment I mentioned before. 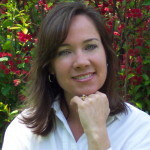 As a writer, I imagine it took Kate Klise a lot of pondering and rewording and walks around the block to make that ending as perfect as it is. So, if you’ve got an idea that might not initially scream “I’M A PICTURE BOOK,” like a dental hygiene crime-fighting saga or a Chaucer-inspired ode to individuality, it still might be. IF … you are a master at your craft. Names. Some people might think “Astrid” is an unusual name for a little girl and wonder why the author went with something so unusual. Many times, when I critique manuscripts for conferences I attend, I see very basic names used. “Timmy.” “Susie.” “Janie.” I think the writers are trying to play it safe. But, I just got the directory for my daughter’s school, and here are a handful of name of the elementary kids. “Florentina.” “Estelle.” “Maxine.” “Jagger.” “Tarek.” “Jocelyn.” “Lucille.” “Reidar.” “Ivan.” “Stella.” “Celeste.” “Holden.” “George.” “LuElla.” This almost makes me want to have another child just so I can name it “Maxine.” But, no. I’ll stick to using great, creative names in my picture book manuscripts. Books. 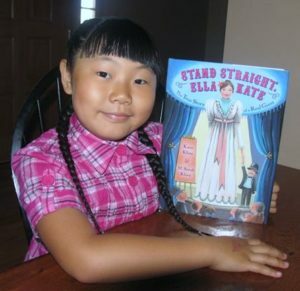 The Klise sisters have other wonderful titles out including one of my all-time favorites — STAND STRAIGHT, ELLA KATE. This is a delightful nonfiction title that everyone who hasn’t read should. My daughter, whom I can’t believe used to be that small, poses with it below. Check it out, too. 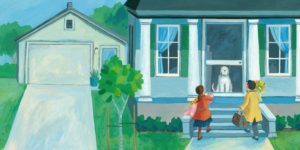 Dogs, Kate Klise, M. Sarah Klise, Pat Zietlow Miller, picture book. Bookmark. I love the Klise sisters’ books! I can’t wait to see this one. Stay is on my reading bucket list. Sounds like a real charmer! Thanks for sharing. This sounds lovely. Thank you! Awesome. Thanks for sharing, Pat. One of my WIPs is a bucket list! This will make a good comp book. Stay is a wonderful book…so heartwarming, and that awww moment is sigh-worthy. Great post, Pat. Thank you! What a lovely book and a lovely post. Thank you! 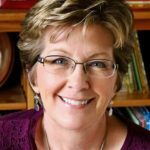 Pat–I fell in love with this book for many reasons. It’s lovely and hits all of the right notes. Plus my dog, Becca, is a senior dog now, and her relationship with my daughter, an only child, has inspired so many of my stories. Even though I’ve read it many times now, and know the ending, it still makes me weep every time!! Your review of this books is stellar. I enjoyed reading it and now I want to check out that book. (I’m a sucker for a dog book.) Many thanks for writing such a wonderful review! Thanks, Pat, for introducing me to this book. I have a feeling it’s going to make me tear up. And that’s a good thing. Many thanks Pat, for sharing this book with us. I have a feeling it will be a keeper for a long, long time – a book that will outlive us all! And That’s great news. I’ve been reading a lot of books about death for young children and i’m adding this to my list. Yes my granddaughters have unusual names too. I guess now that the usual name sounds unusual to us! I just read this book last week and loved it. It’s sweet, poignant and has so many relatable moments for children. And I loved that Eli didn’t die in the end. That prevented it from becoming another “pet death” but made it even more special. Ideas come in all shapes and sizes. Some needing more work than others. Sounds like a great story to me. Pets getting older is a reality kids face. So glad this book finds a positive approach to an unavoidable fact of life. Thanks for sharing this book. I too might have thought a critique partner was off track with this concept but you’ve shown us how well it can be done! Dog stories with an “Awwww” moment are my favorites! So curious to read this and see how masterfully Kate handled such a delicate subject. Death and animals. I’m weepy just thinking about it. I held off reading CHARLOTTE’S WEB until this year, thinking I was finally sufficiently mature. (Wrong.) But I’ll try this one, knowing the dog doesn’t die (Not a spoiler for me.). Thanks. I want to immediately go read this dreamy book. Thank you for sharing. Thanks for sharing this title with us, Pat. My daughter and our German shepherd- collie mutt grew up together for almost 18 years. It was hard when it came time to say goodbye. A book like this might have helped us focus on the joys rather than the sorrow. I’ve admired the Klise sisters since reading Regarding the Fountain with our son years ago. So clever and funny. This one looks like a gem. Although with two elderly pooches, I’m a little afraid to read it. I’ve read this book. It’s beautiful and it started me hunting every book I could find by the Klise sisters. This sounds lovely, both story and pictures. Will be watching for it. This is the sweetest review ever. Many, many thanks! And give our best regards to your daughter.